A Manual Machinist (also referred to as production machinist, set-up machinist) is a tradesperson who set up and operate a variety of machines such as lathes, mills and grinders to fabricate, modify, or repair mechanical instruments and equipment. The need for qualified Manual Machinist in the Gulf Coast Region is anticipated to grow by 37.7 percent by 2022. The median hourly wage is $19.88 with entry level positions below that rate (Source: Workforce Solutions, 2016). The Manual Machinist Program prepares students for Entry-Level careers in a high-skill, high-growth occupation. Instructors bring field experience into the classroom to provide technical and hands-on training. Classes meet two nights per week to accommodate work schedules. Students interested in the Manual Machinist Program must complete the Mechanical Maintenance Technician Basic Occupational Skills Award prior to enrollment. Students completing this program will receive an Occupational Skills Award for Manual Machinist and OSHA 10 credential. Hazelwood Act – Assistance is available to veterans, their spouses, and eligible children through COM’s Student Financial Services/Veteran Affair’s Office. This course is an introduction to machining fundamentals. Students will use lathes, milling machines, drill presses, power saws and bench grinders. They will learn machine terminology, theory, trade mathematics, part layout and bench work using common measuring tools. They will demonstrate tooling maintenance and material handling, plus perform basic machine shop maintenance while following safety guidelines. This course is an introduction to the common types of milling machines and their basic machines, part nomenclature, and basic machine operations and procedures. Students will identify milling machine components and their functions, calculate speeds and feeds, and set up and operate milling machines. They will apply safety, machine mathematics, blueprint reading and theory. The course is an introduction to the common types of lathe machines, part terminology, basic machine operations and procedures. Students will identify lathe machine components and their functions, calculate speeds and feeds, set up and operate lathe machines. They will apply safety, machine mathematics, blueprint reading and theory. This course is a study of advanced lathe and milling machines operations. 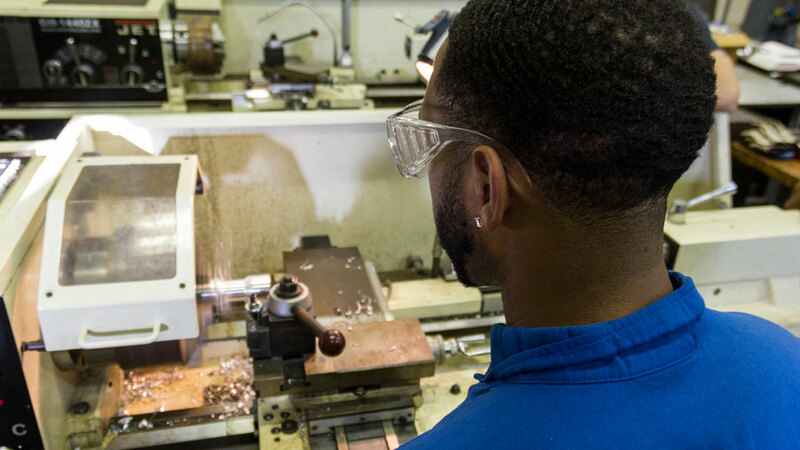 The student will learn advanced cutting operations of lathes and milling machines, including the use of special tooling, bench assembly and materials identification.